A friend recently saw a picture posted on Facebook by a friend and wanted to find out where that picture was taken. The picture was of someone on a lake and she could not pinpoint exactly which lake it was, but had a general idea. She asked me if there was a way for her to see the location of the photo on a map. Luckily, the photo was geotagged and therefore had the essential info needed in order to see where it was taken. In this article, I will show you how you can find out whether it is possible to find out where a photo was taken. Before you can determine the location of a photo, the photo has to be geotagged. Geotagged basically means that the longitude and latitude of the photo has been stored in the photo metadata. The metadata is the invisible part of the photo called EXIF data. Depending on the camera, EXIF data will store the current state of the camera when the photo was taken including date and time, shutter speeds, focal lengths, flash, lens type, location data, etc. Of course, the only way you’ll see where a picture was taken is if the camera is GPS enabled. If you have a camera that doesn’t have any type of GPS option, then there won’t be any location data in the EXIF data. This is true of most SLR cameras. However, if the photo was taken with a smartphone and location services are enabled, then the GPS coordinates of the phone will be captured when you snap a picture. The only problem is that a lot of social media sites like Facebook and Instagram now strip out the EXIF data for privacy and security concerns. So, unless the user adds a location manually, you may not be able to determine the exact location. I had previously written about how to view EXIF data using free tools and you can definitely get the latitude and longitude using these programs and then plug them into a map. However, unless you want to see a lot of camera specific settings, an easier way to just view the location of a photo is to use a free online tool called Jeffery’s EXIF Viewer. The neat thing about this tool is that it’s on the web, so you don’t have to install any extra software on your computer. Secondly, it will automatically determine if location data is stored in the image and even show you a map with the coordinates taken from the picture. You can either point to a URL of an image on the web or you can upload your own file from your computer. On the left side you’ll get basic info about the image like the camera, lens, exposure, flash, date, location and size. As you can see above, this photo was taken with my iPhone and so it has location data available. If you scroll down, you’ll see the map with the exact location the picture was taken. If there is no map shown, that means the photo does not have location data. There you go! That’s pretty awesome right! If you scroll down even more to the EXIF section, you can see even more cool data about the photo like the altitude and even the direction I was pointing when the photo was taken! So far this has been the easiest way for me to figure out where a picture was taken. And if you see a photo online, for example on someone’s Flickr account, you can download it and as long as it still has the EXIF data, you can it run through the viewer to find out lots more details. Unfortunately, if the EXIF data has been removed or if there is no location data stored in EXIF, then you will not be able to determine the location of the image. The only other way is to try to do a reverse image search of the location to see if it matches something on the Internet. 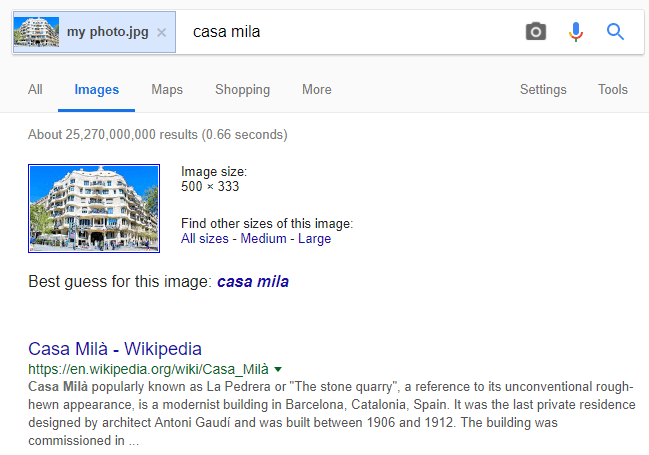 I’ve written a detailed post on how to perform a reverse image search, which may work for you if there is a landmark of some sort in the picture. For example, here is a photo of a famous building, but do you know what it is? It’s the Casa Mila in Spain. There are probably millions of photos of the same building that Google already has indexed, so it figured it out very quickly. Obviously, you’ll only be able to do this with photos that have landmarks or unique geographical features. Someone standing in their backyard will most likely not work. Hopefully, you can determine the location of your image. Enjoy!